Last June 7, top model and a former Victoria Secret Angel Karlie Kloss expressed her complains through her social media accounts after her delayed flight and was angered about the service of the Philippine Airlines . She first posted on her twitter and declared PAL as an airline with the worst customer service of all time and called it the most budget airline. Karlie also documented her experiences with the said airline through her snapchat with her selfie and with words written “No One Flys Philipines Airlines..and now I know why. Before she arrived in the Philippines, she first attended the Council of Fashion Designers of America Awards (CFDA) where she was a presenter for a Swarovski award that was awarded to Womenswear where she was an ambassador for the jewelry brand. After the said event, she then went to JFK International Airport where she was still in a great mood not until she reach the country. 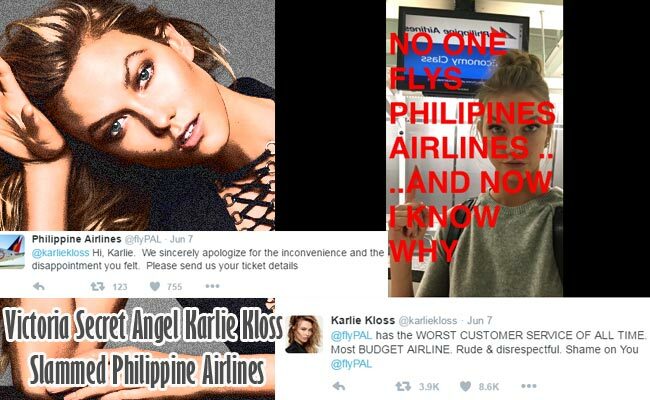 Hours after her complains, Philippine Airlines responded to Karlie through twitter and apologized on her inconvenience. Karlie then replied where she accept their apology and sent them a private message. Meanwhile PAL released a statement to the media that their counters usually closed one hour before the time of departure. Karlie’s flight departure was 12:15 am last June 7 where the counters will close at 11:15 pm, June 6 but the model arrived at 11:40 pm. The airline also revealed that they help Karlie refund her ticket and to rebook her flight back to Vancouver. They were also happy that Karlie responded to them and they also sent her a formal letter where it was stated that they have no intention to cause her inconvenience. Filipino netizens had mixed reactions to Karlie’s complaints. Some said that if she wants to experience the worst service for an airline company, she should try Cebu Pacific while others said that Karlie is just being a brat just because she’s a famous model.